Ayvalık is a city in Northern Aegean, Turkey. It’s located on the southern coast of the Gulf of Edremit (part of Aegean Sea), across from the eastern coast of Greek island of Lesvos, opposite its capital (Mytilene). Ayvalik was an important trade centre during Ottoman times, it had an autonomous status and even many European powers setted up consulates. The city then was almost completely inhabited by Greeks, who were exchanged with Turks from Crete when a population swap was mandated between governments of Turkey and Greece in 1923. The fusion of local Greek and Cretan cultures caused the character of today’s Ayvalik: while most of the physical historical heritage is clearly Greek, the everyday culture lived on the streets between those buildings, including the local food, is mainly Cretan. 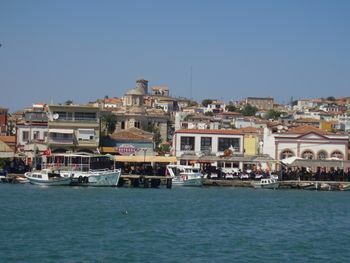 Ayvalik’s ancient name was Kydonia. Although both Kydonia and Ayvalik means ‘the place of quince’, the city is rather known for (and indeed surrounded by) a seemingly endless forest formed by olive trees. Olive has been important to Ayvalik in all ages, as it has been revered by both former Greek residents and present Cretan ‘immigrants’ (who live in Ayvalik for at least three generations). Ayvalik is one of two bigger towns in northern Aegean Region which has achieved to conserve its traditional architecture (to a high degree, that is), with the other such town being Foça, which is located about 60 km north of Izmir. The nearest airport is Edremit Korfez Airport(EDO) which is 40 km distance and has direct flights from Istanbul and Ankara. A larger and international airport, Izmir's Adnan Menderes Airport(ADB) is 175 km away. The nearest station is Balikesir, on the line between Izmir (Basmane station) and Bandirma on the Sea of Marmara (with fast ferry connections to Istanbul). There are two trains in each direction every day, when only one of the trains runs. Between Balıkesir and Ayvalık, the bus takes about 1 h 45 min. The city is located close to (approx. 5 km away) main Çanakkale-Izmir highway (road number: D550/E87). Those approaching from Istanbul may consider taking one of car ferries to Bandirma to shorten total driving time. Otogar (bus station) is located in town centre, near the waterfront. It's about 15-20 minutes on foot away from town square. Ferries connect Ayvalik with the Greek island of Lesvos daily during the high season. A round trip costs 10€/person and 20€/person with catamaran, tickets can be bought from several different offices found on the main road around the harbour in Mitylini - Lesvos. In low and shoulder season however there are only 4 ferries per week. Local buses run frequently from Alibey Island(Cunda) to the center and from Ali Cetinkaya to Camlik districts. As a more comfortable and faster option, "Dolmus" taxis run from Alibey Island(Cunda) and from Ali Cetinkaya to 41 Evler districts. There is also a ferry operating between Alibey Island(Cunda) and Ayvalik town center in the summer months. Alibey (Cunda) Island A small road bridge connects Lale Island which in turn is connected by a causeway to the mainland (Ayvalik). There are frequent dolmuses (shared taxis) and half hourly buses (line #3 Hastane-Alibey Adası, they also stop at otogar) throughout the year, in addition, in summer, there are also small ferries carrying passengers From Ayvalik to Alibey Island, on the hour. Many churches and monasteries are located on the island, the most famous being the Taksiyarhis Church. The bell of the church stays at the Bergama Museum. The island is also famous for its fish; you can see fish restaurants located next to each other by the seaside. Old Ayvalik Houses The old Ayvalik houses, many of which are beautiful examples of neo-classical architecture, located on Alibey Island and in the town of Ayvalik should carefully be examined for the art of wood and stone. They can be seen on the back alleys of town centre, on Alibey/Cunda island, and in Çamlık. Çamlık is the southern suburb of the town with some magnicifent neo-classical manors located amidst pine woods (which translates as çamlık in Turkish, the origin of the name of the place). On a nearby hilltop is the Devil's Table (Şeytan Sofrası), a rock on which has a large footprint-like hollow, which is said, according to the local folklore, to be Devil's footprint he left when he was "jumping" over to Lesvos. It has a wonderful view of the coves and islands below. Saatli Camii — In the town centre, built by Greeks as a church -named Agios Iannis, it was converted to a mosque after 1928. However, other than the plaster on the frescoes on the inner walls, and the thin and somewhat picknicky-looking minaret, no further additions made to the building. Its name translates "mosque with clock" in Turkish literally, referring to the clock located on one of its towers. Taksiyarhis Church Built in 1873, Taksiyarhis Church is the center of attention with its reliefs picturing the life of Jesus Christ, the portraits os the Saints and its interior marble design. Saint Nicola Church is on Alibey Island. Leka Monastery can be observed on the left side of Dalyan Channel when entering the bay, amongst olive trees. Its architecture closely follows traditional monastery architecture as monks themselves built it stone by stone. Sarimsakli Beach 8 km. south of the town, Sarimsakli beach is 7 km. long and widens up to 100 metres. Along the beach, there are a number of restaurants and hotels. Altinova Beach 13 km. south of the town, Altinova is famous for its beach as well as picnic areas and its forest. Around the outlying islands in the bay, especially in the area off Güneş Island, Yuvarlak Island and Kerbela Rocks offers some diving opportunities. The most popular area is the waters off Kiz Island with interesting underwater fauna at a depth of 19 mt. Watch the sunset at the Devil’s Table (Şeytan Sofrası) on the top of the hill (south of the town) overlooking the town, bay, coves, and the islands. Everything related to olive: Olive oil, brined olives, castile soap… Take a stroll in the famous street market "Persembe Pazari" on Thursdays in the narrow streets in the back of the town center. Local cuisine heavily features seafood and wild herbs, served cooked or raw, usually dressed with olive oil. This is a tradition largely unusual to the rest of the country, brought to town by Cretan immigrants. Local cuisine can be had at numerous restaurants both in downtown and on Cunda Island. (+90) 266 is Ayvalik’s telephone code. This page was last edited on 13 February 2017, at 18:56.